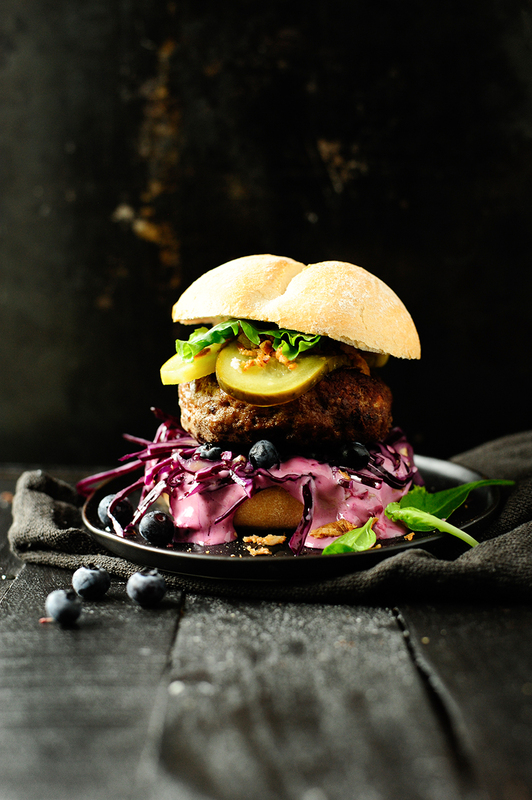 Beef burger with a surprisingly delicious spiced up blueberry sauce! This is the perfect comfort food weekend recipe! As most of you already know, three years ago I opened a food truck, some of the past favorite dishes I showed you before ( you can follow me on Instagram for more stories). The first year it was the smoked salmon salad with blueberry vinaigrette or quinoa with sheep cheese, year two it was the pulled beef tacos with blueberry coleslaw. This year I made this burger and it was a real hit, everyone loved it. It’s juicy, full of flavor and every bite is delicious. The secret is the dressing with a homemade garlic sauce, stewed blueberries and jalapeños, it’s so simple but that adds so much flavor and it’s just so freaking good! You can use it with tacos, as a nacho dip sauce or eat it with grilled meat,… All I have to say, is YUMMM. Combine the ingredients for the coleslaw and set aside. Put the blueberries in a saucepan, add sugar and heat over low heat. Stir constantly until all sugar is dissolved. In a bowl, combine mayonnaise, cream, garlic, jalapeño and pepper and add 2 tablespoons stewed blueberries. Combine the meat with the egg, bread crumbs, flour, salt and pepper. 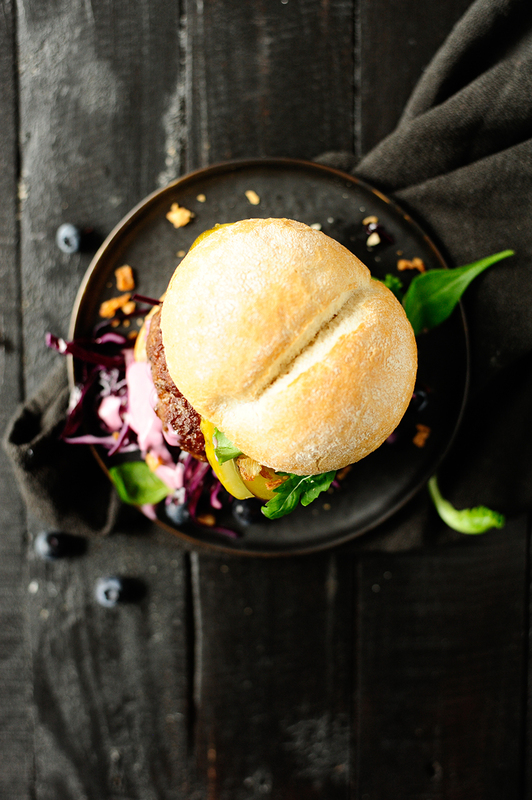 Shape into 4 burgers and grill on a pre-heated grill or in a skillet with a tablespoon butter until deeply golden. Toast the buns. Spread the sauce on the bottom bun, top with the coleslaw, burger, crispy onions, cucumbers, then the salad and finally the top bun. Enjoy! !